St. Matthew’s owes its beginning to three English visionaries who all hailed from London. Mrs. Elizabeth Gething and her husband journeyed to the Texas panhandle in 1892. Mr. Montagu Kingsmill Brown became a resident of Pampa in 1903. Mr. Cecil Payne Buckler settled in the small Texas community in 1905. 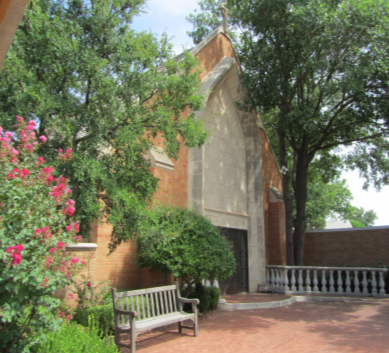 Their vision of seeing an Episcopal parish serving the area of the panhandle would eventually blossom and grow to become the beloved St. Matthew’s that exist today. When these three visionaries arrived in Texas around the turn of the century, the panhandle was part of the Missionary District of Northern Texas, overseen by Bishop Alexander Charles Garrett. This District was one of three Episcopal districts which made up the state at that time. During the mid and late 1800’s, Texas had been designated as one diocese, the Diocese of Texas. The General Convention of 1874 heard the proposal from the Rt. Rev. George W. Freeman, who served as the Bishop of the Diocese of Texas, to partition the large state into three smaller, more manageable areas. The Convention approved this plan, and the state was divided into the Diocese of Texas, the Missionary District of Western Texas, and the Missionary District of Northern Texas, which included Pampa. The year of 1913 saw the state divided once again from three divisions into five areas. Three areas were designated as dioceses and two areas as missionary districts. The former Missionary District of Northern Texas was down-sized to approximately 77,000 square miles and re-titled the Missionary District of North Texas. April 24, 1925 is the first “officially recorded” Episcopal service to be held in Pampa. That service was held in the home of Mr. and Mrs. C. P. Buckler. There was one baptism and two confirmations performed on that special day. The service was conducted by the Reverend Robert N. McCallum, Rector of St. Andrew’s in Amarillo and Bishop E. Cecil Seaman, serving in the Missionary Diocese of North Texas. Even though this event was the first official gathering of Pampa’s residing Episcopalians, the committed group was considered an unorganized Mission in Pampa. The “congregation” continued to meet regularly for several years in different homes and community buildings around Pampa. Mr. Brown, who had continued to envision an Episcopal Parish in Pampa, purchased two fifty foot lots on August 6, 1926, for the sum of $1,100.00 from the White Deer Land Company. Mr. Brown saw this vision rise to a full-fledged structure, when in 1932 the combination chapel and parish hall were completed on the lots he had so graciously donated. The new structure, a joint gift from the Browns and Bucklers was dedicated on April 10, 1932, by Bishop Seaman, was officially named St. Matthew’s Parish. St. Matthew’s continued as a Mission Church in a Mission Diocese from 1928 until 1955. St. Matthew’s Mission flourished in Pampa while the town grew. As the 1950’s rolled in, St. Matt’s recognized the need for a larger church building. Plans were drawn up, approved, and with a large financial donation provided by Mr. Brown, scheduling began for the new construction on the original lots that Mr. Brown had provided back in 1926. On September 21, 1953, Mrs. Gething, the eldest member of the congregation turned the first shovel of dirt for the new structure, which began immediately. On March 10, 1954, the cornerstone of the present church building was laid. A bible, a cross, a copy of the 1928 Book of Common Prayer and a document describing the contributors was sealed in the stone. The new church building was consecrated on October 12, 1954. The beautiful, traditional structure still serves the congregation today. Built in the old English style with rich, deep grained wood throughout, and intricately patterned light as it streams through the many stained glass windows, St. Matthew’s offers all who enter the feeling of spiritual warmth and friendly welcome. The long ago dream of one English woman and two English men, who traveled from London, then later imagined an Episcopal Parish in Pampa, thankfully planted a seed that has since provided the community with the time-honored reverence for traditional Episcopal worship. As time has marched forward, St. Matthew’s has grown in spirit and service, while its members continue to respond to the many religious and cooperative needs in the area.